The fort is about 300 ft above its surroundings. It is 2660 feet above sea level and covers an area of 12.63 acres. Rohtas Fort was built as a garrison fort and could hold a force of up to 30,000 men. Due to its location, massive walls, trap gates and 3 Baolis (stepped wells) it could withstand a major siege although it was never besieged. Most of the fort was built with ashlar stones collected from the surrounding villages such as Tarraki. Some parts of the fort were built with bricks. The fort is irregular in shape and follows the contours of the hill it was constructed upon. A 533 meter long wall divides the citadel (for the Chieftain) from other parts of the fort. After listening to Haroon’s recount of the Lion King, my mind flashes back again to Qila Rohtas. The Qila is situated in a gorge on a hillock where the small Kahan River meets another rainy stream called Parnal Khas and turns east towards Tilla Jogian range. The fort is about 300 ft above its surroundings. It is 2660 feet above sea level and covers an area of 12.63 acres. Rohtas Fort was built as a garrison fort and could hold a force of up to 30,000 men. Due to its location, massive walls, trap gates and 3 Baolis (stepped wells) it could withstand a major siege although it was never besieged. Most of the fort was built with ashlar stones collected from the surrounding villages such as Tarraki. Some parts of the fort were built with bricks. The fort is irregular in shape and follows the contours of the hill it was constructed upon. A 533 meter long wall divides the citadel (for the Chieftain) from other parts of the fort. The fortification has 58 bastions (towers) at irregular intervals. Out of the 3 Baolis, one of them is in the citadel and the rest are in the other parts of the fort. One of the gates (Langar Khani) opens into the citadel and is a trap gate because it is in the direct line of fire of the bastions. The Khwas Khani Gate is an example of double walling. A small enclave on the western side is a citadel within a citadel. It is accessible by only one gate and has also a very fine Baoli which suggests that it was meant for the Chief and his family. In this citadel there is a beautiful mosque called the Shahi Mosque (not to be confused with the one in Lahore). There are no palaces in the fort except for a structure built by Raja Maan Singh called Haveli Maan Singh. It is built on the highest point of the citadel. The Tilla Jogian is also a historical place; the Tilla Jogian literally means the hill of the jogis (a hill where ascetics abode). It is the highest point in the salt range at 3200ft. It was visited by Baba Guru Nanak (the founder of the Sikh faith), Emperor Jahangir, Ranjha of the Heer Ranjha folklore, Maharaja Ranjit Singh, the warrior king of Punjab, the British and finally by the two times Prime Minister of Pakistan Mian Nawaz Sharif. The Rohtas Fort has 12 gates each of which is a piece of unique construction. The gate links the citadel to the main fort. Named after the Muslim saint Shah Chad Wali, it is also a double gate. The outer gate, the entrance of which is from the citadel, it is 13.3 maters wide and 8.23 meter deep. The inner gate is a simple archway which is 3.66 meter wide. The gate opens to the west and is named “Kabuli” as it faces towards Kabul. Also a double gate, it has an opening of 3.15 meter width. The gate has two bastions one each side has 5 battlements on top and stairs leading you in from the outside. On the southern side of the gate is the Shahi Mosque tempting many to call the gate as Shahi Darwaza or Royal Gate. Just close to the gate, a flight of 60 steps leads you down to one of the fort’s Baolis. Facing the Kahan River is the Shishi Gate, taking its name from the beautiful glazed tiles used in the spandrels of the outer arch. The glaze and reflection of the tiles having Persian blue colour, gave it the common name of Shishi Darwaza meaning the Glass Gate. These tiles are the earliest examples of this technique which was later refined by the artisans of Lahore. Again a double gate, its 15.25 meter high, 3.5 meter wide with a central arch opening, the outer arch has a small window like the Sohail Gate. The outer opening leads to a Langar Khana (Mess or Canteen). There are two balconies on either side of the gate which have kitchen, store and a well for water. The opening of this gate is L shaped. As soon as you enter from the outer gate, you have to turn right. Though many believe this kitchen (Langar) is the reason for calling this gate as Langar Khana; yet the real reason to name this gate is its position of being a passage between boats anchoring station (pattan) and the fort. The gate is 15.25 meter with two bastions on either side. The gate derives its name from the word “talaq”. Talaq lierally means divorce but it is also used in the meaning of ‘condemned’. It’s said that the name stands in the memory of the mishap to Sabir Shah Suri, who according to a common story, entered the gate and had a sudden attack of fever. Taking it as an ill omen, the gate got its name. It’s a single gate 9.15 meter high and about 6.1 meter deep. The gate faces the village Gatali ford (ravine) which is also called Patan Gatali or Gatalian, thus the name. This is an entrance rather than a gate. It is on eastern side of the fort and is about 2 meters wide. There is a bastion next to this entrance. This is a small entrance too. It is 2.13 meter wide. Again a small entrance; has a small bastion next to the gate. There is also a Baoli next to this gate. It’s named “Sar” because Sar means water. On the north stands Kashmiri Gate (facing Kashmir). It’s also called Mori Gate because of its hollow look as of a drain (mori). This gate is named after one of Sher Shah’s greatest General, Khwas Khan. This was the original entrance to the Qila because outside this gate lies the old GT Road. It is a double gate. The outer gate is 12.8 meter wide and 8 meter deep. The gate has a bastion and a defensive wall on each side. On the bastions, cannons could be deployed. The inner and outer gates are almost mirror images of each other. The top of the gate has five battlements. All of these have loop holes as well as machiolations. 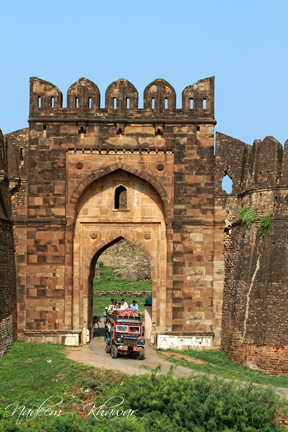 Unlike other gates of Rohtas, the inner side of the gate has five battlements. The small mosque is near the Kabuli Gate. It has a prayer chamber and a small courtyard. It’s the most decorated of all the original buildings in the fort. To be ever ready for an attack from the enemy, stairs lead directly from the courtyard of the mosque to the top of Kabuli Gate. The prayer chamber is 14.2 meter long and 7.3 meter deep. It is divided into 3 equal chambers. These are domes from the inside but from outside no domes can be seen. There is a small room at the end of these tree chambers. This room was meant for the Pesh imam (the prayer leader). The room has a small domed roof from the inside but no outer dome. The mosque is built into the fortification wall. The outer wall of the mosque has beautiful designs of Islamic verses written in Naqsh script. The verses are surrounded by a lily going around the Naqsh script. The lily design was later used by Mughals in Jahangir and Queen Noor Jahan’s tombs and in the Shah Burj Gate of Lahore fort. There are three baolis in the fort. These were made cutting deep into the lime rock. It is in the middle of the fort, for soldiers, elephants and horses etc. This baoli has 148 steps. Each step is 20 cm (8 inches) wide. The upper portion has been cut in stone. It has three arches that span the length of the baoli. It’s near the Kabuli Gate and was meant for the royal family. It has 60 steps and has small chambers that were used as bath by the royal family. A small baoli near Sar Gate, was most likely used by the soldiers. It’s not an original part of the fort and was later added by a general of the Muhghal Emperor Akbar, Raja Maan Singh I of Amber. The general died in1614 so it must have been built between 1550 and 1614. It’s a two storied building constructed with bricks and plastered neatly. Architecturally it has no resemblance to the main construction style of Rohtas Fort. A part of the structure has fallen away. There seems to have been 4 meter square and there are balconies on the outside of the gate. These balconies are similar to the one outside the Sohail Gate. One could see the whole fort from these balconies. Unlike the main construction of Rohtas Fort which is an example of Indo-Afghan architecture, the haveli is a typical Hindu style construction in the fort complex. Rani Mahal or Queen’s Place is near Haveli Maan Singh. A single storey structure, originally it had four rooms but only one remains today. The foundations of the four rooms can still be seen. Like Haveli it is also a later addition to the main fort and was probably built at the same time when Haveli was built. The room still standing today is about 20 feet high and beautifully decorated on the inside and outside. The roof of the dome like room is like a flower. The inside of the roof is decorated with flowers, geometrical patterns and fake windows. The room is about 8ft by 8ft. The fort is an example of purely “masculine” architecture and it places functions over form. This can be gauged from the fact that the fort had no building for living purposes. Even the kings had to live in tents when they came here. The coverings are found on the gate and in the mosque. Most of these are engravings in Arabic and sunflowers. One of such carvings is inside the Shahi Mosque outside the Pesh imam’s room. The carving is of the word “Allah”in Arabic. The stone carving is also done on top of Shahi Mosque. The sunflower motif is on each side of the arches of Shahi Mosque and is also present in the guard post in between each gate. Again most of these inscriptions are in the Shahi Mosque. On the outer wall of the mosque the Kalima is written in beautiful calligraphy on both sides of each arch. These inscriptions are in Nuskh script. There is an inscription also in Persian on the Shishi gate which mentions the starting date of construction. The same inscription is also found over the Talaqi Gate. There are inscriptions on the Khawas Khani, Langar Khani and Gatali Gates too. These tiles are found on Shishi Gate. These types of tiles became extremely popular with the Mughals who further refined them. The tiles on Shishi Gate are the earliest example of the usage of these tiles. The tiles were cast in Lahore. Machiolations are small drains that lead from inside of the walls to the outside. They are built into the walls and are used by the soldiers inside the fort to pour molten lead or other hot liquids on enemy soldiers who could attempt to scale the walls. The Rohtas Fort had hundreds of them and each one is beautifully decorated with geometric patterns. The fort was built on the Afghan-Persian architectural style. Afghan and Persian kings were coming to the Indian subcontinent for at least 5 centuries before the construction of the fort; however, the combinations of these styles were not harmonious. Rohtas Qila is the earliest example of a successful blending of the two styles but Afghan style is more prominent. Sher Shah Suri died before the completion of this colossal yet magnificent structure. Ten years after his death and the end of the Suri dynasty, Mughal Emperor Humayun returned to rule India for another 15 years. The fort was never popular with the Mughals because of its pure military character. Emperor Akbar stayed here for a single night. His son Jahangir while going to Kashmir also rested here but for a single night. He again stayed here when he was forcibly taken to Kabul by Mahabat khan. Noor Jahan, his intelligent, beautiful, and shrewd wife obtained troops from Lahore and ordered Mahabat Khan to release her husband. On his release, Emperor Jahangir then proceeded to Rohtas and held his court for a while. Then he went on to Kashmir and back to Lahore where he died. The later Mughals seem to have made no use of the fort. The prime reason being Mughals’ alliance with the Gakhars and hence they didn’t need any troops to maintain their hold over the area. The Durranis of Afghanistan did feel the importance of Rohtas because Gakhars were equally hostile to them as they were to the Suris. Durrani rulers therefore kept not only a garrison at Rohtas but also had their Governor posted there. They also used this fort as a manual communication grid with their capital Kabul. The Sikhs held power after the Durranis. Maharaja Ranjit Singh was in camp here when he heard the news that his great general Hari Singh Nalwa had been killed at Jamrud by the great Amir Dost Muhammad Khan – the Kabul suburb of Mina Akbar Khan is named after this great Afghan General. The Maharaja gave the fort to Sardar Mohar Singh, who was succeeded by Gurmukh Singh. Subsequently the fort was leased to different people and the last person to manage Rohtas was Raja Fazal Din Khan who joined Sher Singh in rebellion. “Rohtas Fort is an outstanding example of early Muslim military architecture in the Indian subcontinent, which contains features from elsewhere in the Islamic world. It also had a profound influence on the development of architectural styles in the Mughal Empire and hence on the European colonial architecture as well. The later made an abundant use of that tradition and most constructions from the British Raj still carry the same blend every where in Pakistan and India”. Above paragraph stands on page 2 of the report (Document 586) of the World heritage List. It is also outstanding by virtue of the refinement and high artistic value of its decorative elements, notably its high – and low relief carvings, its calligraphic inscriptions in marble and sand stones, its plaster decorations and its glazed tiles. there are no surviving examples of military architecture of this period on the same scale in the subcontinent which survives to the same degree of completeness and conservation. Fatehpur Sikri (India), also on the World Heritage List represents the full Mughal realization of a form and style that owes every thing to its precursor, the great fort of Rohtas. Photo Credits: All photographs except the title image on part IV of this series of post have been taken on site byNadeem Khawar, an eminent photographer of Lahore Email: imagebank775@hotmail.com. However, the picture on title page of Part IV is courtesySirCam photostreams. It’s my dad’s village. We used to go there in summer breaks or whenever we used to have days off from school. I still remember, it was such beautiful moments going there and see the fort door from far away. They had some incredible architecture. 1. The famous Rothas Fort was captured by Maha Raja Ranjit Singh’s General Sadar Gurmukh Singh Lamba from Ghakhar Chief Nur Khan, father of Fazal Dad Khan in 1825. 2. On the death of Sardar Mohar Singh, another General of Maha Raja Ranjit Singh, his military might was put under the command of General Gurmukh, due to large command the Maha Raja gave him the title of Lamba. 3. General Gurmukh Sigh Lamba was one of the well known generals of Maha Raja.. He took part in many of the campaigns of Raja Ranjit Singh. 1. General Sardar Gurmukh Singh Lamba was the recipient of highest military award “IZAZ-i-Sardari” and civil awards Nirmal Bud and Ujjal Didar. Profile portrait sketch of General Sardar Gurmukh Lamba is displayed at the Lahore Museum. The size of portrait is 127×108 mm at serial D-40 [Pre 1922]. The great general was wounded fifteen times; eight times by the musket balls, thrice by the sword cuts, thrice by spear thrusts and once by the arrow. 2. He was one of the commanders of the Fauj-i-Khas Which was trained by Generals Ventura and Allard, both fought the battle of Waterloo under Napolean the great. The Fauj-i- Khas consisted of eleven thousand Ghor charas divided into fifteen Derahs, led by the eminent sardars. Leading among them were Sham Singh Attariwala, Sardar Gurmukh Singh Lamba and Hari Singh Nalwa. @Col. Harjeet Singh Lamba, Thanks Col. Sb. for the information you’ve provided about one of the eminent generals [Sardar Gurmukh Singh Lamba] of Sher-e-Punjab Maha Raja Ranjit Singh. Late General Gurmukh Singh Lamba’s son Atter Singh Lamba was staying in Qilla Attar Singh and his descendants in one of his Jagir areas. After partition 1947 General’s descendants moved to India. The hidden royal treasure was found in 1951 when the fort started falling due to lack of proper maintenance and the large quantity of valuables were impounded by the Government of Pakistan. Rohtas, the magnificent fort where the great Mughal Emperor Akbar the Great and his father Emperor Humayun while going to Kashmir, stayed overnight. On two different occasions the Mughal beauty Malka Nur-Jahan also stayed for a night in the Rani Mahal part of the fort. I shall stand corrected to my previous comments—-,the fort was captured by General sardar Gurmukh Singh Lamba from Ghakhar chief Nur Khan in 1825.Due to enmity of Dogra Raja’s Main Gulab and Dhain Singh where sardar defeated their father Main Kishra Singh the fort was handed over to Sardar Mhor Singh by the Maharaja on interference of Dogra’s Raja’s holding positions of influence in the darbar.Wen Sardar Mohar Singh proceeded to Banaras against the wishes of Maharaja,the fort was reverted back to General Gurmukh Singh Lamba along with contingent of 7000 horsemen.Thus making the command of sardar long (Lambi).Sardar was of medium height,but to lengthy command he was popularly called by the Maharaja as Lamba Sardar.